Our state testing has provided a nice way to transition from our study of text structure into fiction inferences. As I look ahead, I'm excited to be going back to learning about character emotions, delving into character traits, and trying out literature circles. Springtime fourth graders are so different from autumn fourth graders, which makes the study of literature exciting. They are can find details in stories that they couldn't see before, grasp some deeper ideas, and make some new connections. It's a great time to be a fourth grade teacher. For example, I shared the word chart below with students as we read the book Shortcut by Donald Crews. We talked about how the children's initial worried feeling deepened to panic when they jumped off the tracks to avoid the oncoming freight train. When students work with these lists with their partners, their talk includes deeper, richer language: Are the characters anxious or relieved? Are they content or cheerful? I love using the click and clunk strategy! It has worked so well to help my struggling readers slow down and try to make sense of what they are reading. I thought long and hard before introducing this to my students. In general, I try to avoid strategies that muck around too much with basic reading--I don't want kids to have to think about fifteen different things at once. But the click and clunk strategy really doesn't require very much explanation. If you understand an idea, it "clicks". If you don't, it "clunks". Easy! At least, it's easy with nonfiction. It's been my experience as a reader of nonfiction that I need to keep close tabs on my comprehension, even at the sentence level. In nonfiction, I need to be sure that I am understanding every sentence as I go along. My readers did well with marking clicks and clunks in nonfiction text. But when I read fiction, sometimes I need to let those "clunks" slide. Authors of fiction often try to keep some information hidden. There are often little details that don't fit. Readers have to notice these, and set them aside, trusting in the author to make everything work out by the end. This is tricky for struggling readers. They don't know when to deal with a clunk and when to let it slide. So what can I do to help my fourth graders to find success? They are working toward more complex text, more stories that have complicated sequences, unreliable narrators, and tricky mysteries. I decided to make a simple graphic to show students how they can use those clunks as opportunities--to reread, to solve a word, or to change their mental models. The kids seem to like it, and we've used it together several times. 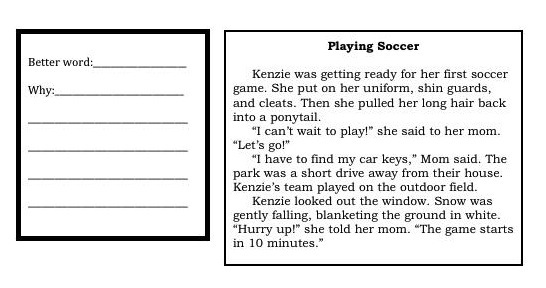 Of course, it's good to have a collection of stories that might cause students to feel this shift in their mental models. Here are some good possibilities. This short story appears in many anthologies, and you might even be able to find a version floating around the web. I like how it packs a great deal into a short space! There is a moment in the story that feels quite creepy, but then everything shifts as the reader realizes that all is not as it seems. The two fabulous new teachers that I work with shared this on the first day of school! It's an easy book, but it clearly shows how a reader might need to make some accommodations to deal with new information. I'm trying this as a read aloud with my students. The narrator tells the truth, but he doesn't tell the whole truth. As a result, there are little bits here and there that add up to a bigger story. The book is also full of figurative language, like personification and similes. 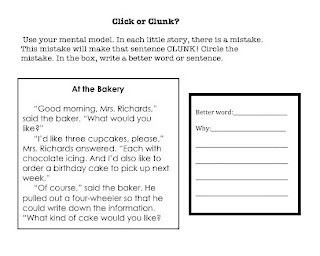 Do you have any other stories that help readers to build mental models and think about their clicks and clunks? Please share them! What's been flying off my shelves lately? I always like to take a breath at this time of year to think about which books my students have enjoyed, which books I'd like to encourage them to read, and where I want to go in the last few months. Everything I get for my classroom library is either purchased with bonus points or on my own. For this reason, I'm very choosy--I only buy what I really like! Or, usually, what my sons really like. My oldest is a voracious reader, and many of the books in my classroom were originally bought for him. Bad Kitty is definitely a hit! Kids love the mix of comics and text. 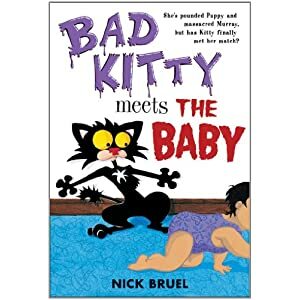 I like that the author, Nick Bruel, weaves in real information about cats. My only complaint is that my copies are never on the shelf! I had to buy a whole new set at the book fair so that I could take two home to share with my cat-obsessed son. Kitty is very expressive, which makes this a nice book to look at character emotions. The books also encourage readers to look at all of the elements on the page--often, the really funny bits are in side notes, the glossary, or the illustrations. These additions make reading all of the text rewarding for young readers. And yet, with the sly humor and the mischief of Kitty, they can't help but feel that they are getting away with something. 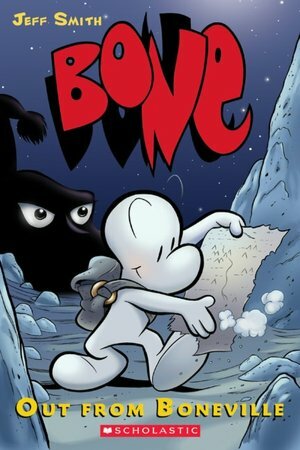 I've had several volumes of this graphic novel series for the last few years, but none of my students ever showed much interest in it. Well, things have changed! Several boys have passing these books around, keeping track of which teacher has which volumes and which are available in the library. I have to admit that I haven't gotten much further in my appreciation of graphic novels than Rapunzel's Revenge, so I haven't really read much of these. Any suggestions for what I should have kids look for? The girls who attacked the Dragon Slippers series at the beginning of the year quickly read this newer book by Jessica Day George. I loved the way that the castle changes and moves. It's a nice bridge kind of fantasy book. There is peril and danger, but it is not quite so dramatic as some of the more complex fantasy series. Kids are still reading The Lightning Thief! I wondered if this series would continue to attract readers even after the Last Olympian. But there is just something about these books! While none of my students have stuck with any of the Harry Potter books for more than a few chapters, I have two students right now who are on the second and fourth books respectively. Note to all teachers who are stuck with state testing: Never, never tell students that they can read a Rick Riordan book "when they are done with the test". I made the mistake of doing this when The Sea of Monsters came out many years ago, and I'm convinced the kid rushed through the test just to get to my copy of the glossy hardback book. I can't blame him--I would have done the same thing! And doesn't it really show good reading instruction, that a student would rather read a real book than spend hours looking over a test? However, with the tests mattering so much these days, I think I might just hide The Last Olympian until all of the bubbles have been neatly filled in. No sense in tempting fate. I wrote about these at the beginning of the year. I have some chalk trays that I use for book displays. Because we're heading into testing, I set these books out again as light reading. I was a little curious to see how my newly mature fourth graders would react. Would they pretend that they weren't even there, like when I set up my beautiful display of habitat books? (Yawn!) Or would they swoop in and take them with such ferocity that I would need to appoint someone to make sure that they were all returned by the end of class, as when I put up the Mo Willems display? The real truth is somewhere in the middle. There is a core group of kids who are still drawn to these books. They still pass them around to read and re-read. And it's not just the struggling readers, either. I really want to figure out why the kids like these so much, so that I can find others along the same lines! I got my first copy of this book when I was in third grade. Now, I'm thrilled that it has a measure of status in my classroom! Over the last few years, I've worked hard to collect enough poetry books so that I could have every kid in the class reading a poetry book at the same time. The used book store at the library and the nearby discount bookstore have helped me immensely in this quest. One day, as we were studying poetry, I handed out the books. Well, word got around that the Random House book was the book to get. Now I have kids ask for it whenever we have some free time. If you were looking to add one book to your library this spring, this is the one to add! I don't have any kids reading Andrew Clements this year, which is surprising. When we start literature circles in a few weeks, I'm going to introduce Frindle to try to build some interest for this favorite author. As I mentioned before, Harry Potter is not very popular, nor is Margaret Peterson Haddix. 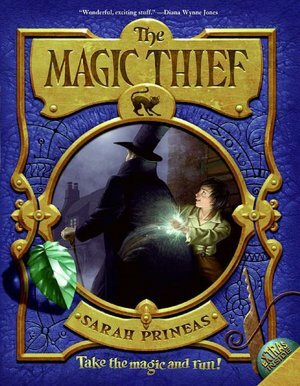 I've decided to do The Magic Thief as a read aloud for my reading class to build their stamina and interest in longer, more complex books. While I do have some kids who are happily still reading The Magic Treehouse books, A-Z Mysteries is not popular this year. It's always interesting to take stock and see what this year's kids have liked! Every group is so very different, and every group teaches me more about watching kids and suggesting books. What is a mental model? I worked with my readers to figure this out this week. We had already talked about the word "model" in social studies class. (This site from National Geographic has a nice lesson for understanding what a model is.) I told students, "Mental means in your brain. So a mental model is a model of a text in your brain." We went back to the last text we had shared together, and discussed how we pictured this text in our brains. 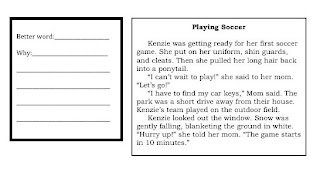 My students are familiar with the words visualize and schema, so we looked at how readers use visualizing and their schema as they build mental models. These mental models will be important for us as we move into more complicated texts this spring. Some of the stories that are ahead will have holes in the narratives, flashbacks, or twist endings. Having a mental representation of the text will be vital for readers to comprehend these more complex narratives. The first step, then, is to help readers see what happens when their mental models shift. How could I get students to understand this? I decided to try an error detection exercise. In these kinds of tasks, a reader needs to read to find an error. I was very cautious about this--I don't want kids to think that reading is about finding the mistake!--but I wanted them to understand what it feels like when there is a detail that just doesn't fit. They loved it! We used choral reading to read the passage together. When they found the error in the first passage, some started laughing. "I can picture it, but it doesn't make sense," one student said. Then, they had to figure out a word that could fit in the text. This was a little trickier for them, but all of them figured out a word that would fit. The next passage was a little more difficult. It was interesting watching students as they worked on this one. They came up with different ways to fix the passage. Some changed the weather in the sentence, while others changed the kind of field that the game would be played on. After we did a few more, students worked with their partners to write their own little texts. Some of them turned out very well--one group wrote about a girl who was playing basketball and "kicked" the ball into the net. At the end, we talked about how they had built mental models for each text. They found the whole activity very enjoyable, which is always a plus! -What background knowledge do you need to use? -How did the mistake affect your mental model? ...and, of course, keep the search for errors short and sweet. Next, we're using what we've learned to read a text with a twist ending. Readers will need to make some fast adjustments to their mental models to understand what is going on. Instead of changing the text, they'll have to change their mental models. Hopefully, finding these errors will have given them some scaffolding for this next step.